Early in the process, I decided that my list would only include fiction since I read very little nonfiction. Reading a lot of debut novels, it’s no surprise that 50% of my picks are debuts. I also like historical fiction, but even I was surprised that six of my picks fall into that category. Only one of my top ten was written by a man, but I think that’s more of a fluke. Do I have a favorite book of 2016? Maybe, but I’m not even going to try to figure out what it is. They’re all wonderful! All Things Cease to Appear by Elizabeth Brundage – This is one of three novels on my list that I read prior to starting Novel Visits. All Things Cease to Appear is a dark story about two families in a very small town in upstate New York. It opens with a husband finding his wife brutally murdered in their bedroom. From there Brundage moves back in time and weaves the stories of these two families around the murder. Brilliantly done and hard to put down! 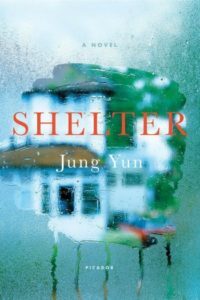 Shelter by Jung Yun – Shelter is yet another stellar debut novel for 2016. Jung Yun told a beautiful, but brutal story about a young husband and father struggling to love the parents that gave him everything but kindness. Had his parents not been the victims of a horrific crime, Kyung might not ever have had to confront his feelings. This isn’t an ordinary dysfunctional family story. It’s dark, violent, and sad. Yun’s shocking turns had me glued to every page of this book! 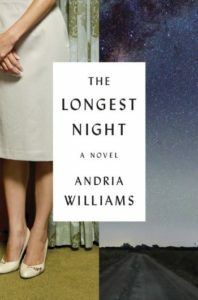 The Longest Night by Andria Williams – I can’t put my finger on exactly why, but Andria Williams’s debut novel is one I have thought about a lot this year. Maybe it’s because it’s from a different era than many historical fictions. Maybe it’s because of the imagining of the Sand Point nuclear meltdown. Or, maybe it’s because of the brilliant portrayal of a marriage in trouble. Whatever it is, The Longest Night is one of the books I have most recommended to friends this past year! Most of these are on my TBR. 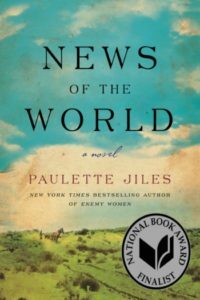 I just bought News of the World, and am starting The Mothers this week. This is a wonderful list, Suzie. You have my top 3 books on your list! 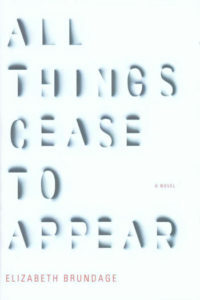 And All Things Cease to Appear looks really good – I’m going to add that one to my TBR for when I need a page turner. 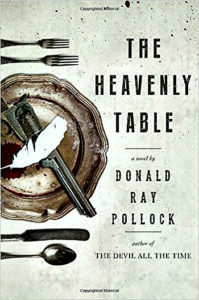 You also have a couple that I DNF’d on here (Heavenly Table and The Longest Night). 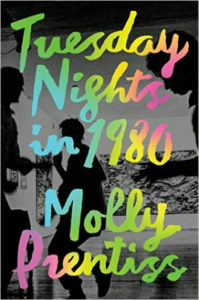 I’d still like to read Tuesday Nights in 1980! There are just so many books. It’s impossible to get to all of them. (And frustrating, too!) I think you’ll really like All Things Cease to Appear. The two families are both VERY dysfunctional! I loved The Liliac Girls. Shelter sounds really good. Thanks for the recs. Commonwealth and Shelter will both be on my list, too! I’m planning to read most of the others. Great list — and so glad you included Lilac Girls, which hasn’t been getting as much attention as it should. 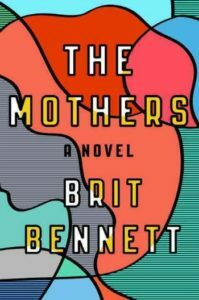 I’m heading out of town for a few days and have been saving both The Mothers and All Things Cease to Appear — can’t wait to read them. Happy New Year! I so agree with you about Lilac Girls. It was wonderful! Enjoy your trip and the books! I have not read any of these, but you give compelling reasons to look into all of them. 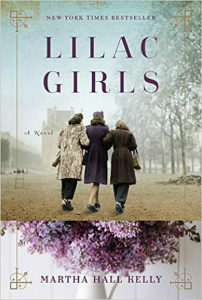 Lilac Girls is one I had not heard of and with Ann’s recommendation as well it sounds like a must-read. I love that you read and feature a lot of debut novels as well — new writers need encouragement. I definitely hope to read News of the World next year! 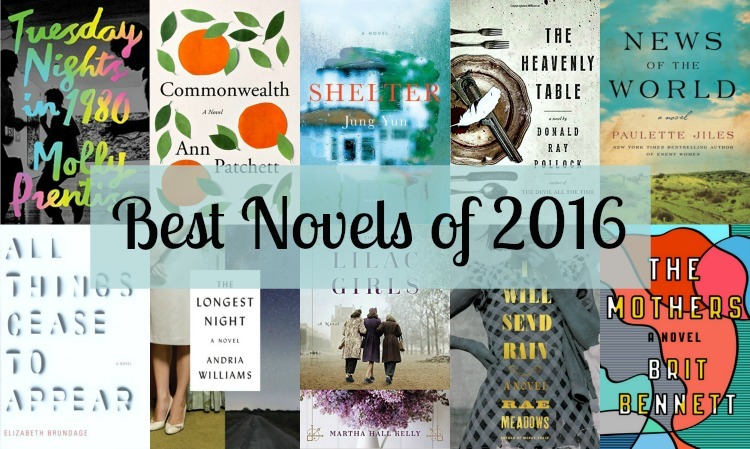 Thanks for sharing your favorite novels of 2016. Loved several of these books as well! 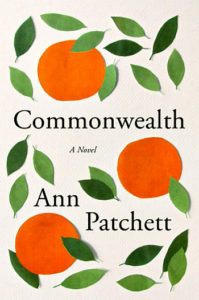 I read my first Ann Patchett this year (Bel Canto) and am looking forward to reading Commonwealth hopefully soon. Great list! Bel Canto was the book that made me an Ann Patchett fan. I think you’ll love Commonwealth. 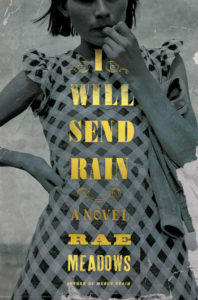 Great list and I do want to read Commonwealth and The Lilac Girls. thanks for stopping by! Middle school teachers…we’re all a little crazy! I want to start reading Ann Patchett. 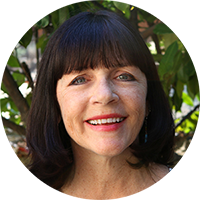 I recently read an article she wrote and I am interested in getting to know more about her. 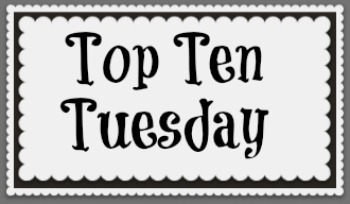 I love “Best Books of…” lists and yours added several titles to my 2017 list of books I want to read. 🙂 Thanks! Commonwealth is actually the only book on your list that I’ve read, although most of them sound like my kind of books. So much to read, so little time! Isn’t that the sad truth! oh geez, you’ve just exploded my ‘to read’ list for this month/this year! I keep thinking if we could get the publishers to hold off publishing new books for a couple of months to let us catch up on all the fantastic books already published then life would be perfect 😉 For some reason they haven’t bought into my idea! I so agree with you. That TBR pile just keeps getting bigger and bigger and there is always new “candy” to try!